汉化新世纪论坛>汉化工具>分享SDL Trados Studio 2014 ..
SDL Trados Studio 2014 Professional is the complete translation environment for corporate language professionals, who want to edit, review and manage translation projects, as well as organize corporate terminology. Used by over 190,000 translation professionals worldwide, SDL translation software allows companies to deliver world class localized content to support their global sales and marketing efforts. SDL Trados Studio 2014 features a modern, intuitive design, with a workspace that is easily customizable to suit the needs of the user. Combined with Studio's range of productivity features and the ability to work on the widest range of file formats, Studio users are properly equipped to deal with any type of translation project, no matter what. AutoSuggest Smart suggestions as you type: Benefit from sub-segment matching suggestions as you type to help you accelerate your translations. Watch your productivity skyrocket! SDL PerfectMatch Leverage previously translated bilingual files to create PerfectMatch content. A quick, simple way to reduce review time and ensure consistency. Context Match: take accuracy to new heights: Provides beyond 100% matches by recognizing location and context to deliver the best translation. No complicated set up or configuration required! 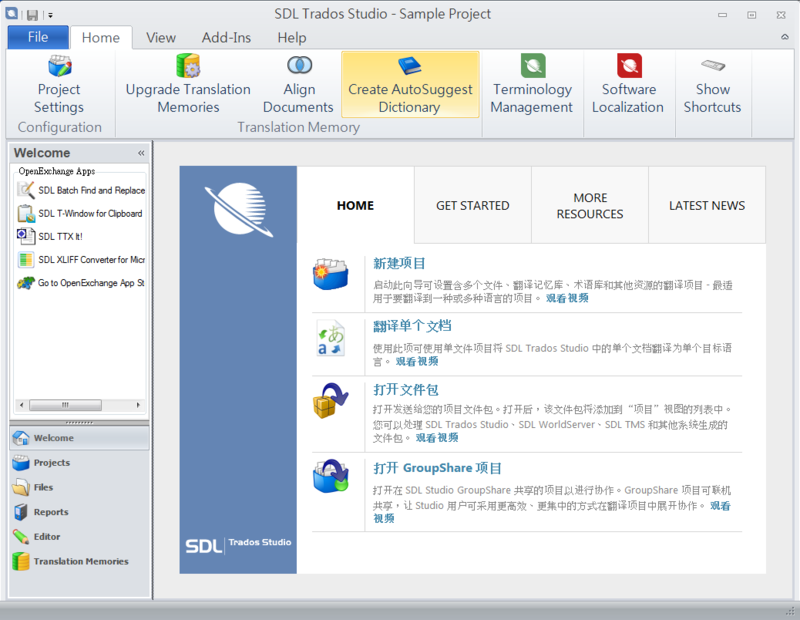 Simplified project management: You can do more than just translate with SDL Trados Studio. You can also manage languages, files and deadlines in one centralized location. Automated project preparation: SDL Trados Studio can help you automatically prepare project files, with a customizable project wizard that takes care of the most repetitive task. Reporting: Word count, analysis and reports are automatically created and stored with your job meaning you always know the status of each job at all times. Track Changes: Never miss a review again with native Track Changes. This allows users to confidently review and easily accept or decline changes as you go, giving full review control. Go beyond Studio with SDL OpenExchange: Working with reviewers who do not use Studio? Add extra flexibility to Studio 2014 with a selection of apps from SDL Open Exchange. Enhanced QA Checker: Studios automated, QA checker highlights translation errors including punctuation, terminology and inconsistencies. The new QA wizard simplifies and speeds up the review process. Integrated or standalone terminology management: Terminology accuracy is critical for high quality translations. Through integration with SDL MultiTerm, users can always deliver the right term. SDL MultiTerm, also included as a standalone application when you purchase SDL Trados Studio, provides the most robust terminology solution in the industry. Connect with automated translation: No TM match for a particular segment? Automated translation will help you get there. Easily accessible from within your editing environment. QuickPlace for maximized efficiency: Have all formatting, tags, placeables and variables at your fingertips. QuickPlace delivers smart suggestions based on your source content making translating any file type a breeze. SDL Trados Studio supports the most recognized industry standards such as XLIFF bilingual files, TMX translation memories and TBX terminology databases. With SDL OpenExchange every user can also extend, customize and increase the functionality of SDL Trados Studio. Visit SDL OpenExchange to download apps or join the developer community to start creating your own.